I’ve been using Alfred on macOS to locate and open files for years now. It’s quick, efficient and just the sort of tool any serious Mac user should use. One thing I didn’t realise though was that when searching for files, you can perform a Quick View in the same vein as the native Finder application. All you have to do is type in your search keys as normal and when the potential results are listed, press ⬆ or ⌘+Y to bring up the Quick View. When I found out about this, I did a quick search online to see how many other ‘one-key’ shortcuts were available within Alfred that I had neglected over the years and I was pleasantly surprised! I’m going to play with some of them and report back on the ones I think you may find most useful. One thing that Apple has worked on a lot recently is the performance of the battery in the various models of iPhone. Battery Life, which is the amount of time that your device is running before it’s in need of a recharge, as well as Battery Lifespan, which is how long your battery lasts until it needs to be replaced, have improved greatly. There are, however, steps that we can take as end-users to improve both of these metrics and prolong the life of our devices. Let’s be honest, they aren’t cheap and if you aren’t worried about upgrading every single year then eeking out some extra battery life is always a good thing. With the (mini) heat-wave we’ve just enjoyed in the UK, I was curious as to what happens to my phone when left in direct sunlight. Quick research pointed out that the optimum temperature for your phone is 16º-22º C (62º-72º F), although it’s still designed to perform well between 0º and 35º, so on this side of the pond, this isn’t too much of a problem. If it does go over 35º, you may find that you permanently damage your battery capacity. Also, if you charge your device at a high ambient temperature, this can damage the battery further. On the note of temperature, be mindful of the case that your iPhone is in. The case may act as an insulator and warm your phone up whilst charging. If you notice your phone getting excessively hot whilst charging, make a point of removing it from its case beforehand. With the majority of iOS updates, there are tweaks designed to improve battery life and reduce energy consumption. If practical, try to keep up-to-date with the latest version of iOS. This also has security benefits too. Reducing the brightness of your screen can make a tremendous difference to the battery life. I have mine set to Auto Brightness and (so far) have never felt the need to increase the level manually, even in brightly lit areas. There are two main points to note with Wi-Fi. Firstly, if you are out and about with no plans to join a Wi-Fi network, then turn it off. If Wi-Fi is enabled then your phone will poll for new networks at regular intervals, reducing the amount of charge you have on your phone for this cycle. Switch it off until you know you need it. To that end, not many people know that if you have a choice between using your data connection and using Wi-Fi to access data, Wi-Fi actually uses less power, so always opt for that where possible (and secure). Do all of your apps need to be polling in the background for new information? Go to Settings -> General -> Background App Refresh and you’ll see a list of applications with toggles next to each. Turn off the ones that aren’t needed. If you’re feeling daring, turn them all off with one switch at the top of the screen. Lots of applications try to enable Location Services by default, however, I’d say there is only a handful where this is truly useful. To see your applications that have this enabled, go to Settings -> Privacy -> Location Services. Turn off those that aren’t needed. If you go to Settings -> Battery, you can see a list of applications that have been in use over the last 24 hours, or 7 days, listed in order of battery consumption (highest to lowest). From here, you can see the culprits that need tweaking, although be mindful of the fact that the percentage is not an exact science, it’s just relative to the total amount of battery used. If you don’t have a battery problem, then the percentage is OK. For more information, click the clock icon to see some facts relating to exact amount of time on screen as well as background activity to ascertain whether you need to take action. My workflow for Task Management has taken a bit of a new direction over the last few months or so. I’m not putting everything into Omnifocus anymore. There are some things that are simply better suited to another style of application, which is why I’ve started playing with some Kanban alternatives, namely Trello and Zenkit. If I have a project that has a number of recurring steps (for example, creating a series of videos), this is much better suited to a Kanban board, with a centralised task sitting in OmniFocus telling me that today, I’m going to be working on this project. In that task is a link to the Trello/Kanban board that I’m working on. I’m also using these boards for capturing ideas and moving them to maturity. Which booksdo I need to buy/read/am I reading? A board system is great because I can move the book title card as I purchase/read/start reading accordingly. I can tag the books with author names to keep a record if I wish. What apps do I want to perfect? Are there new TV Programmes or films that I want to buy/watch? Games, Gift Ideas - these boards really help me with projects that always follow the same template. As lots of ideas go into these boards, I need to be able to capture efficiently, so that’s why I’m going to show you how I use Drafts on iOS to process these ideas and send them to the Trello. You will see a box named Link To This Board and within is a URL. The Board ID is the character string that follows http://trello.com/b/. Make a note of this Board ID. Obviously if you wish to use Drafts to post to other boards too, each will have a unique Board ID so these will need to be collected. For the purposes of this walkthrough, I am using Drafts 5 however the process is very similar for Drafts 4. On the next screen, name the action appropriately, click Steps and then + again. On the Step Type screen, scroll down to Callback URL. On the Callback URL page, copy the following text into the Template box, substituting BOARDID with the ID you captured earlier. Go back to the main Drafts page and type your text. In the Actions list, click on your newly created action and the text should go to Trello. Also, as we have defined the success parameter within the callback-url to go back to Drafts when completed, so it doesn’t keep you in an application you don’t want to use right now. Repeat this for as many boards as you need to add to. I love the fact that I don’t have one central inbox anymore for all of these ideas and I can send them directly to the correct board with one touch. They stay in the left-most list until I’m ready to process and this works really well for me. I hope this helps - feel free to comment with how you automate this kind of idea capture with Drafts/Trello/Omnifocus or any Task Manager of your choosing! We’re always happy to hear your thoughts. Over the past couple of months, my mail workflow has changed. I used Airmail a lot on all devices. Aesthetically it’s great on the eye, lots of Power User actions and it was a pleasure (in the main) to process my Inboxes. I did find, however, that there were occasions where mailboxes weren’t syncing correctly and I was losing important messages. Also, there were times when messages were being stuck in my Inbox on one device, despite being moved to Trash, or Archived, on another. As much as I try to minimise my use of email, it’s still got to be reliable when I need it, so despite the fact it still looks kinda ugly, I moved back to Mail.app as my default Mail client. I also use MailButlernow which makes using Mail a lot more pleasant and I’ll write about my experience with this application soon. One thing I missed about Airmail when I first moved across was the Searchingcapabilities. By default, Airmail will search all mailboxes rather than the one you are currently in so this was a habit I had got into that needed to break. Why do I rely on Search so much? Well, my workflow means that I have a minimised email structure. For each email account I have (unfortunately I have several clients, meaning several different accounts as I work with them), I have an Inbox and an Archive folder. Oh, and Trash of course, however I don’t really count that. I don’t like the whole subfolder culture that is around. If I took the time to file every email that came in into a dedicated folder, I’d never have time to work! Also, how often do I find myself retrieving that email? Not often. 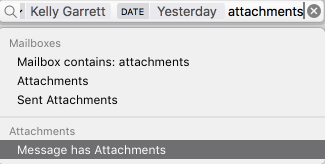 The time taken to file is a lot longer than the time it takes to perform a search on the whole, so I decided to learn as much as I could about how to search effectively within Mail.app. I was pleasantly surprised when I dug a little deeper and while the below isn’t an exponential list of all of the functionality, it highlights how I use it daily, so hopefully will help you. I didn’t realise that Mail was able to understand natural language. I guess I’ve been away from it too long, so when I started to type in phrases like from Kelly yesterday or pdf files to Mike, it was nice to see the right results appear. I’ve got into using natural language parsing a lot when using apps such as Fantastical 2 and voice assistants such as the Amazon Echo so I’m pleased that I can keep that habit going. You aren’t limited to one search term. Once you’ve clicked on your first search element, continue typing and another list of potential search criteria will appear below. Click again, rinse, repeat as often as necessary. You can see below that I’m creating a search for emails from my wife, received yesterday, that have attachments. If I find myself searching for the same criteria more than once, I’ll save the search so that I can use it again at the click of a button. When you’ve configured your Search criteria, click the Save button below the text entry field. You’ll see a dialog window appear that allows you to configure what is known as a Smart Mailbox. Smart Mailboxes are ace. Just like a Smart Playlist in iTunes, Smart Mailboxes are dynamic and will only show you emails based on the searches you have defined. If you find yourself always looking for emails from your boss that were sent in the last week, then setup a Smart Mailbox that will only show these messages. Saves a lot of time. Sometimes I know roughly when I received an email from somebody, however I”m not entirely sure as to the exact date. You can specify a date range for Mail to search through. Type date followed by a colon and then the range. Of course, we can utilise BOOLEAN operators if we want an effective search system, such as AND, NOT and OR however I have to say I don’t use them as often as you would think. Generally, I find 95% of the emails I need using the methods above and in a very timely manner. There are occasions where using BOOLEAN operations has helped with complex searches, however if it’s something I may need to search again, I’ll simply setup a Smart Mailbox and use the built-in tools for building the search there. So that’s a brief overview as to how I search for emails in Mail on macOS. If you find you need to use more complicated methods than this, or indeed you have simplified ones, then comment below! Would love to hear from you. How many times do you find yourself searching for web content a day when you’re on your Mac? Ten times? Twenty? More than fifty? OK, it’s a rhetorical question, we know it’s a lot however it’s only recently that I’ve stopped defaulting to Google for every search I make. If I need to check the definition of a word, I go to Google first. When I watch something on TV and recognise an actor, yet can’t remember for the life of me where they are from, straight back to Google again. Who are my favourite football team playing this weekend? Once more, straight to Google. (OK, sometimes it’s Alexa, but she seems to have the hump with me a lot of the time and refuses to understand my wonderful British accent).